First album in three years from this cult Bristol band that includes members of Flying Saucer Attack and Movietone. Their most beautiful, accessible release yet. 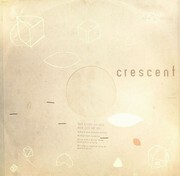 Crescent first emerged in the mid-nineties, as part of the incredibly vibrant Bristol post-rock scene that included artists like Flying Saucer Attack, Movietone and Third Eye Foundation. The Crescent line-up includes members of both Movietone and Flying Saucer Attack. This is their fifth album, and follows the English / pastoral direction of their last album ‘By The Roads And The Fields’. ‘Little Waves’ is a collection of songs that unfurl slowly and recall points from John Fahey to The Velvet Underground, Galaxie 500 to Hood, The Pastels and beyond. 06. "Come Into The Shade"
08. "Birds Came Out Of The Trumpet"